316 pages | 6 B/W Illus. The response of the international community to the pressing socio-ecological problems has been framed around the concept of ‘sustainable development’. The ecological pressure, however, has continued to rise and mainstream sustainability discourse has proven to be problematic. It contains an instrumental view of the world, a strong focus on technological solutions, and the premise that natural and human-made ‘capitals’ are substitutable. This trajectory, which is referred to as ‘weak sustainability’, reproduces inequalities, denies intrinsic values in nature, and jeopardises the wellbeing of humans as well as other beings. 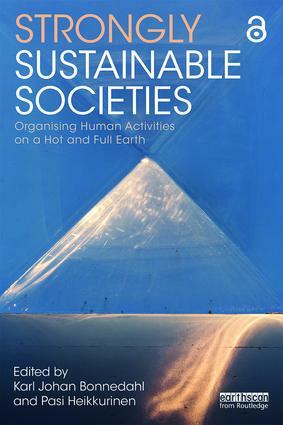 Based on the assumptions of strong sustainability, this edited book presents practical and theoretical alternatives to today’s unsustainable societies. It investigates and advances pathways for humanity that are ecologically realistic, ethically inclusive, and receptive to the task’s magnitude and urgency. The book challenges the traditional anthropocentric ethos and ontology, economic growth-dogma, and programmes of ecological modernisation. It discusses options with examples on different levels of analysis, from the individual to the global, addressing the economic system, key sectors of society, alternative lifestyles, and experiences of local communities. Examining key topics including human–nature relations and wealth and justice, this book will be of great interest to students and scholars of environmental and development studies, ecological economics, environmental governance and policy, sustainable business, and sustainability science. Karl Johan Bonnedahl, Senior Lecturer / Associate Professor, Umeå School of Business, Economics and Statistics, Sweden. Pasi Heikkurinen, Lecturer, School of Earth and Environment, University of Leeds, UK.